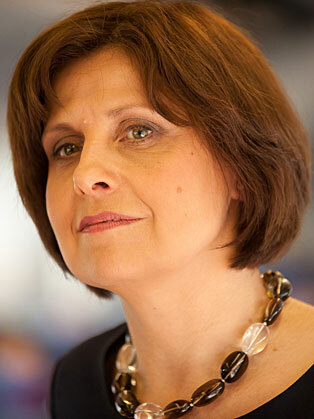 Born in 1965, Rebecca Front has forged a career in comedy as well as drama. Whilst studying, she toured with the Oxford Theatre Group in the revue Stop the Weak. It was here that she met future collaborator Patrick Marber. In 1989 she made an early appearance on TV, in the children's sitcom Tricky Business. But it was on the radio that she really made her mark, becoming a regular team member of On the Hour. This led to her being cast in other shows produced by the cast, including Lionel Nimrod's Inexplicable World and The Day Today. A number of other TV roles followed, including the Alan Partridge vehicle Knowing Me, Knowing You… and as a regular in the second series of Big Train. She has also appeared in Nighty Night and Stressed Eric and in the Inspector Morse follow-up, Lewis. In 2013 she appeared in the BBC Four suffragette sitcom Up the Women, alongside Jessica Hynes and as a panellist in Jo Brand’s Great Wall of Comedy. In 2015/2016 she starred in the BBC period drama War and Peace. Outside of Front’s work in the media she is an advocate for mental health and has worked with mental health charities such as Mind and Anxiety UK. Front suffers from panic attacks and anxiety ad has written candidly about the subject in her book Curious: True Stories and Loose Connections.